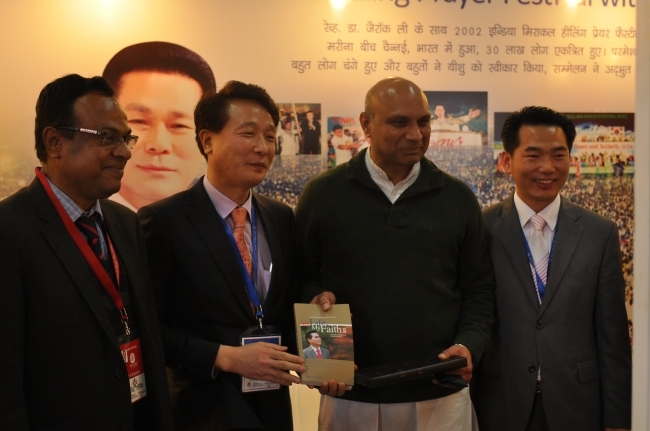 South Korean publisher Urim Books exhibited books written by pastor Lee Jae-rock at the New Delhi World Book Fair 2014, from Feb. 15 to 23 at Pragati Maidan, New Delhi. Alongside participants from 25 countries, Urim Books presented “The Message of the Cross” by Lee, author and senior pastor of Manmin Central Church, with copies translated into 56 languages including English, Hindi, Tamil and Nepalese. Five other Christian books by Lee, “Spirit, Soul and Body(1),” “Heaven (1,2),” “Hell” and “The Power of God” were exhibited in the Korean Publishers Association booth, according to the publisher. The publishing house also displayed its electronic books available through Amazon Kindle and the Apple iBook store. India’s oldest book fair was organized by the National Book Trust, a body under the Ministry of Human Resource Development, aimed to promote the habit of reading.